In July 2018, a Luxembourg delegation organised by FEDIL – The Voice of Luxembourg’s Industry went on a US road trip focusing on ICT innovation. 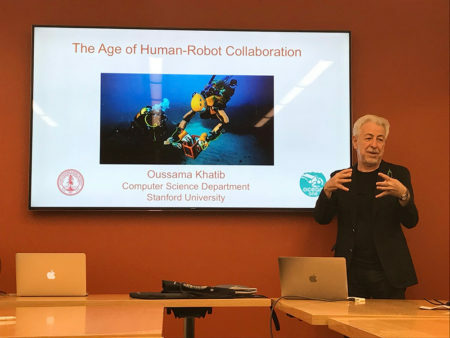 We met with Professor Oussama Khatib, Head of Robotics at Stanford University, who explained his “Ocean One” project: a deep-sea humanoid robot diver that was conceived to explore the shipwreck of La Lune, Louis XIV’s flagship vessel which sunk in 1664, and has remained intact ever since. “Intact” is the key word here since any deep-sea submersibles could already have descended to the wreck, but returning objects safely to the surface would have been impossible. To develop a robot diver sensitive enough to handle the fragile objects from the wreck, Professor Khatib and his team worked with haptic technologies that are used to recreate the sense of touch. The “Ocean One” robot has haptic sensors that allow its operator to feel the touch and pressure of the robot’s “hands” and manipulate it with great control and delicacy or, if you prefer, have a physical presence in a virtual world. The research in this technology is directly applicable to many other sectors. It can be used in healthcare to make it possible to perform surgery remotely or for exoskeletons used for rehabilitation. It is also applied in industrial and high-risk environments as well as in the automotive sector and, of course, in gaming. A Russian start-up that develops exoskeletons that help the disabled regain mobility recently set up operations in Luxembourg, using the country as a market entry point for Europe. One of the topics that is central at every international fair, exhibition and mission is drones. Efficiency, safety and security seem to be the key areas of development in the drone sector at present. Obvious applications include the visual coverage of large open agricultural land and maintenance inspections of hard-to-reach equipment like cranes or tall buildings. Domestic drone delivery services of parcels or other objects continue to seem fiction due to weather-related challenges and the noise pollution that this would bring, but spontaneous drops of vital supplies in emergency situations is already a reality. Although the project of a Dubai drone taxi service, first tested in September 2017, might take some more time in development, we are seeing heavier payload capacity being developed to enable the likes of seed dispersion or film applications. The key to teaching children is to retain their interest, and what better way than with robots. A South Korean company is currently in talks with schools to test a novel way to teach children coding by providing “robo-cubes” that can be programmed via a simple interface. Once assembled, these cubes can make sound, light and movement, which all are basic features of a robot and compatible with Lego. If the company’s current pilot project is successful, it will install its European HQ in Luxembourg to develop the product and its wider integration. The initial guilty feeling of shoplifting passes in around 15 seconds. 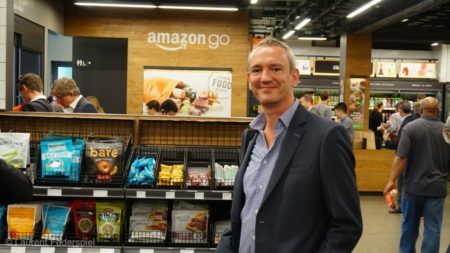 A visit to Seattle took us to the Amazon Go flagship store, a futuristic, fully autonomous shopping experience. When entering the shop, you just use its mobile app to scan a QR code. Using hundreds of cameras for personal recognition, the QR code links your video-rendered presence to your Amazon account and tracks your every motion in the shop. You simply walk around, pick up what you want and then leave the store. The initial guilty feeling of shoplifting passes in around 15 seconds, when algorithms have interpreted the camera images, calculated your purchases and sent the bill to your smartphone. Variations of this technology are being applied in smart city applications, transport and of course policing and security services. The Interdisciplinary Centre for Security, Reliability and Trust (SnT) of the University of Luxembourg has several active projects in this field and will soon open an R&D project with a company recently arrived from China which will apply this technology to multiple sectors. We have encountered lots of interesting technologies and concepts and met many fascinating and dedicated people during our travels. Each one is excited and proud to explain their work, and we are honoured to have had them open their doors to us. One constant that we encounter is the need for collaboration. Be it for cultural, resource or geographic reasons, many of the entrepreneurs or researchers that we meet are looking for partners to accelerate their work, and a number of partnerships have already formed with Luxembourg players. Sometimes they take shape naturally during a trade or economic mission organised by the Luxembourg Chamber of Commerce. In other cases, we help identify the right partners through the Luxembourg Cluster Initiative.